Professional carpet stain removal Irvine, CA. If we can’t remove the stain, no one can! Call (949) 612-7464 for more information. Active Chem-Dry technicians excel at removing the most difficult carpet stains in Orange County, CA. We are confident we can remove or minimize any carpet stain. That includes red wine. That includes ink and crayon. You name it. We have the finest green cleaning products at our disposal and innovative equipment able to combat the toughest carpet stains you can imagine. But don’t delay! Your best chance for successful stain removal is immediately after the spot is made. The longer a stain sits on carpet or upholstery the harder it is to remove. Keep the stain damp if possible until you are able to address it or until Active Chem-Dry arrives to remove the stain. While most stains can be removed with household items such as vinegar or baking soda, some require advanced technical skill and expert cleaning solutions and often times store-bought chemicals and products do more harm than good. Trust the professionals. 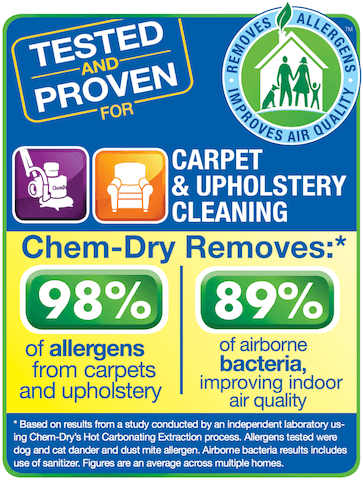 Active Chem-Dry leads the industry in products and solutions, helping customers win the battle against tough stains. Some carpet stains are common. Some are rare. Some are easier to clean than you would expect and some can not only ruin your carpet but your floorboards too! Even though carpet stains can be very different there are a 10 carpet stain removal tips that apply to all kinds of stains. Be Quick. Don’t leave carpet stains for later. Address them immediately. Your manufacturer’s stain-resistant treatment buys you a little time but not too much. The longer you wait to attempt to remove the stain the greater the odds it becomes permanent. No carpet is 100% stain-proof. Your best bet at preventing permanent stains is keeping as much dirt outdoors and away from your carpet as possible. We offer a lot of great carpet care tips to help prevent stains and soiling. But when stains do occur, remember, act fast! Blot. Find a white towel or paper cloth. Don’t use colorful cloths to avoid dye bleeding into the wet stain. Blot the stain with the cloth. Don’t scrub the stain! Don’t Scrub! Scrubbing can cause pile distortion in the affected area of the carpet. Instead, continue to use a dry cloth or paper towel until the area is 100% dry. For a stain that includes a mix of liquids and solids, use a spoon to scrape up as much as possible. Solids should be removed as best as possible and vacuumed until there is no longer a trace of them. If the stain can be identified, consult the Carpet & Rug Institute (CRI) Spot Solver tool on their website. The tool provides methods for stain removal ranging from blood, beer and beet juice to soup, soot and syrup. Pretest. Pretest the spot removal product you intend to use in an inconspicuous area to ensure the solution won’t harm your carpet fiber or dye. Once you have applied the solution to the area you’ve chosen to test in, hold a white cloth where you’ve sprayed for 10 seconds. Examine the carpet and cloth for color transfer, color change, or damage to the carpet. If you notice any kind of change in the appearance, it’s best to not use that solution to attempt to remove your stain. Less is More. 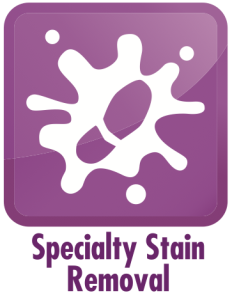 Cleaning agents are often relatively strong, requiring only a small amount to efficiently remove or treat most stains. There’s no need to use an excessive amount. Just apply a small amount of the cleaner to a white cloth and work it gently into the stain for best results. Remember, “Just a dab will do ya!” for more stain removal treatments. Outside In. Start with the edges of the spill and work your way toward the center in order to prevent the spill from spreading across your carpet. Once again, be sure to blot the stain and avoid scrubbing. Absorb as much of the stain as possible and continue to repeat this step if necessary. Stick with It. There’s no need to use alternative cleaning solutions if you are seeing the spill transfer to your cloth or napkin. That’s all the evidence needed to know that it is working. Patience is key to carpet stain removal, especially the real tricky stains. Complete removal of the spill might mean you will need to repeat one of these steps several times. Don’t continue past this point until the stain is completely removed from your carpet. Rinse. Now it’s time to rinse any of the remaining cleaning agent from your carpet. Rinse the affected area with cold water and then blot it with a different cloth until you’re confident that all traces of the solution are gone. If the solution isn’t completely removed there’s a chance it could cause resoiling in your carpet and lead to future stains. Dry. Weigh down a half-inch of white paper towel with heavy object on top of the affected area of your carpet. Change the paper towel as needed until the area is dry. If you need the stain to dry faster, a dry compound can be used, although the paper towels typically work well over time. Call. If you’ve completed each of the above steps and the stain remains you will want to call a professional carpet cleaning service. Call (949) 612-7464 for same-day appointments from Active Chem-Dry. Active Chem-Dry Copyright © 2019.